Tell us about your gardener. Beginner or advanced? Young or old or neither or both? We'll design a delightful, earth-friendly Garden Gift Basket just for him or her. Presenting a Foodscapes Garden Gift Basket is a fun way to tell your loved ones that you have ordered a Foodscapes Garden or Garden Care Plan for them. We'll fill it with their favorite plants and seeds and a gift card with details about their forthcoming new Garden or Plan, with a personal message from you, of course. Includes watering can, kid-sized gloves, seed packets, 4” potted plant, kid-sized tools. 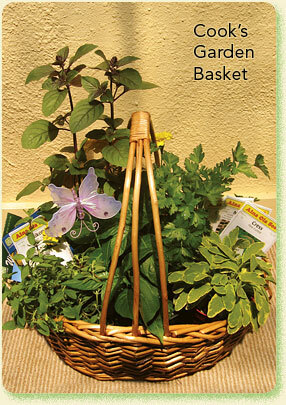 Includes a variety of potted culinary herbs and vegetables and seed packets, beautifully arranged in a reusable basket.